Our company was preparing a presentation for an important client in the financial sector. I joined a team of designers and subject matter experts to produce assets in support of this presentation. 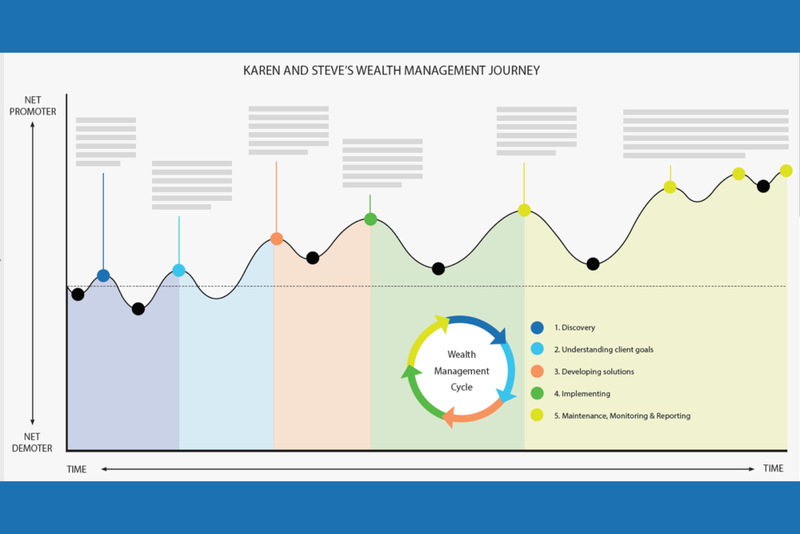 The journey map pictured here is one of the assets we produced. Our goal was to demonstrate a deep understanding of our client, their industry, and most importantly, of the needs and mental models of their customers. Our task was to illustrate how our mobile, automation and analytical solutions would help the client better manage relationships with their customers. The image illustrated above show the architecture of the journey map we produced for this meeting. Our team explored several design alternatives, before choosing a promoter/demoter motif. The goal was to illustrate the emotional impact our client could have on its customers. Word of mouth remains one of the most powerful ways for a product or service to be promoted. This journey illustrates how reconnecting with your customer at the right times will rekindle their appreciation for your services and encourage them to promote you among their peers. The final image used during the client presentation (not shown) contains text descriptions for each step in this journey. It describes how and when the financial advisor should engage the customer, and how our company’s technologies play an essential roll in keeping the customer happy by anticipating their needs. The assets we produced were used in the final presentation with the client. Journeys such as these play an important role in promoting confidence among our clients that we possess expertise in their industries and, hence, can be trusted to serve their best interests.